Mr. Pawlish and i started watching Dr. Quinn Medicine Woman today... man, that show is a lot more intense than i remembered it being as a kid! it is really amazing, though. i bought the show so long ago, i'm glad we're finally starting to watch it. i love having the complete show to watch, having tv shows available now is the best! 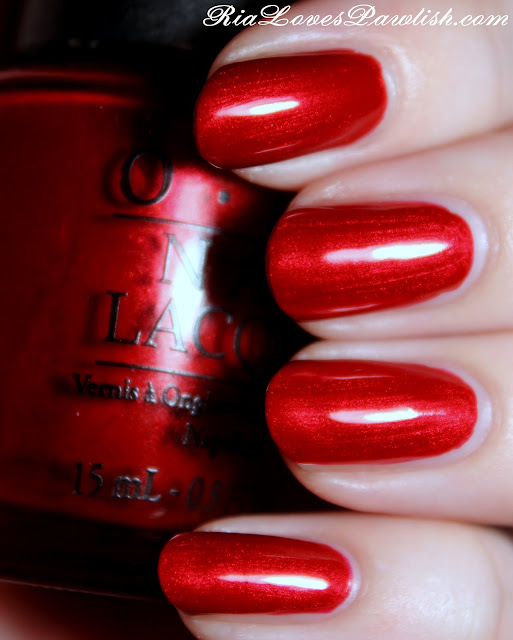 today we have OPI Danke-Shiny Red from their 2012 Germany collection. it's a really lovely shimmery red that would be perfect for Christmas... or anytime you're looking for a great red! it's definitely a fun color, super saturated with cool undertones... i think it's a true candy apple red :) you can see slight brushstrokes, but you really have to look for them! the formula is great, two easy coats for full opacity. two coats Danke, one coat Seche Vite. Hi Ria, I stumbled upon your blog from your cosmoprof sparitual post. I love the bright candy red of Dannke. It makes me feel like the holidays are coming! hi, thank you so much for stopping by :D Danke makes me feel the same way, it's such a cheery color! OPI Schnapps Out Of It! OPI Nein! Nein! Nein! OK Fine! Ulta Butter London Deal Day Haulage!